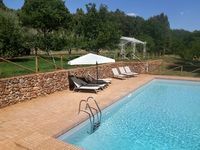 Property 3: Typical Tuscan Style Villa with Private Pool and Large Private garden. Property 13: Villa Costa, Superb Villa in the heart of Tuscany. Fantastic place to stay and use as a &quot;base&quot; to visit Tuscanny. Francesco was an outstanding host; helpful, responsive and not at all intrusive. A true gentleman that will be a long remembered friend for years to come. The villa was great and perfect for our 2 couples. Comfortable - relaxing; a great place to be. Wonderful and beautiful property and home. Lisbeth was a great host. We were two couples traveling. The property is in the Tuscan wooded hills with lots of property to roam around in. Be sure to bring food to cook in the in kitchen. We enjoyed our time here.